A friend of mine asked me to review the video MORMON EVIDENCE (Part 1 – Full-Length) — The Authority of God’s Word by Jake Hilton. It’s a solid 4 hour video — so it took a few days to review the video in its entirety and gather thoughts for it. (Yes, I did listen to all four hours!) — here’s the embed below. After doing that I did further follow-up research which I’ll write about. So, to finalise our content exchange, I’ll now provide some commentary about this video in particular, this video series, and other relevant discussions. It’s amazing that you can spend so much time studying Mormonism and many of the break off groups and still, you will find more of them: a different view, a different interpretation, a new selection of “Mormon beliefs” in a new, unique configuration. Now, it’s probably not fair to call this a “break off group”, since it’s not really a group (yet?) — but Jake does have a modest following (9K+ subscribers on YouTube) and a whole new set of ideas and interpretations — certainly “group potential”! So I’m assuming that Jake grew up in the LDS church. And then went “less-active” for about five years (according to his own narrative in the video). Then, it seems he somehow came across Rodney Meldrum / Wayne May’s content. This content (and other stuff presumably) helped to “re-activate” Jake, now having him “converted” into a very serious Mormon. A source of mine commented that Jake used to be a “youth outreach” person for Rod Meldrum, but I have no external place to verify that statement. 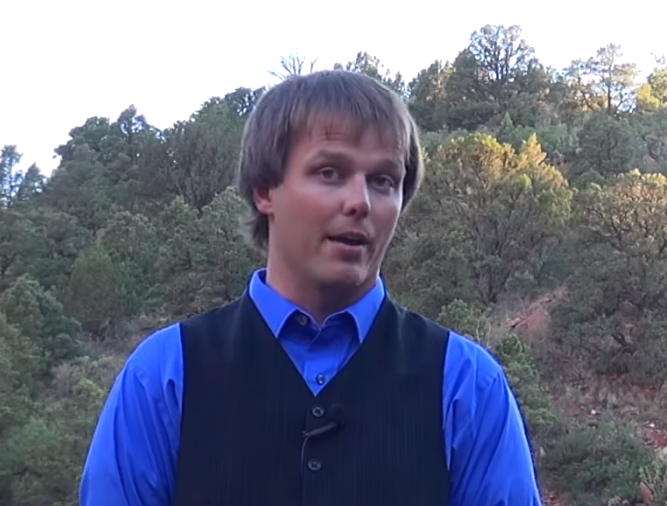 So, then about four years ago (April 6, 2013, presumably aimed at the supposed “birthday of Jesus” according to Joseph Smith) Jake started publishing videos on his channel Mormon Evidence. The Mormon Evidence channel has a large quantity of content dealing with a variety of topics, mainly around “Book of Mormon archaeology” / “evidence”, “signs of the times” series, and then the latest series “The Sword of YHVH” which seems to deal with an even larger variety of topics in a kind of “scripture study” style. It also turns out that he was once a ninja! That’s pretty awesome. Brings a whole new meaning to “have you received his image in your countenance” doesn’t it! So I was wondering why this is the case and asked around. 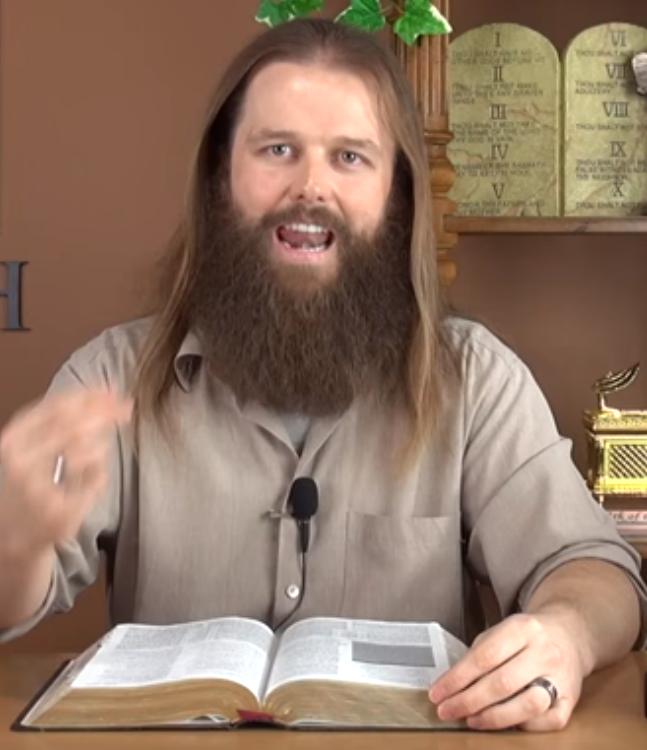 Someone else who had reviewed his videos in the past said that he claims to have been visited by Jesus and that Jesus commanded him to change his appearance. I could find the Jesus visit but not the commandment to change appearance. If anyone has a reference that’d help me to make the article more complete, apparently it’s on his Facebook page or his videos “somewhere”, but since there are hundreds of hours of them and I only have “so much” interest in researching him I have not dug around to find this one reference. So as I was watching this series I just knew — I have seen so many religious “fanatics” before and, sooner or later, they claim to be either Jesus himself (reincarnated) or a prophet of some sorts (AJ Miller of the Divine Truth was one I had studied to reasonable length before) or something else. I was waiting for it, but you know — it’s only the first four hours, with series like these you have to dig 80+ hours in before you get the real meat. So I went digging to see if anyone could give me a more direct reference. 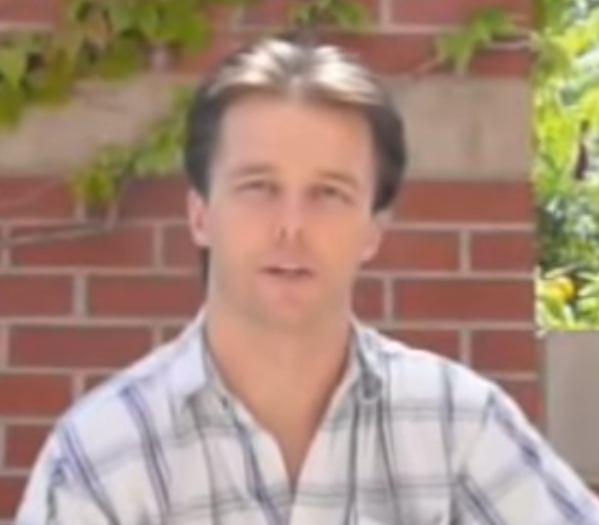 It turns out that at the end of The Time is NOW — Part 3: Intro (3 Keys for Discerning Truth), after giving his audience a firm warning that if they know this stuff prematurely and don’t obey it then they are under condemnation, Jake explains that he has several unlisted YouTube videos (so they’re not on the main page), hidden behind this particular video as a gateway (you can see them in the comments). So then, after another number of hours of documentary, Jake looks his audience in the eye, starting at 5:18:20 of this video. “I know that Jesus IS the Christ, that YHVH IS the Messiah, because I know Him. I have seen Him. I have felt His hands. And when I felt His hands they were as tangible as if I were to feel your hands. It was on August 16th 2015 that I saw and felt the hands of Jesus Christ. Up until August 16th of this year (2015) I’d had numerous experiences of dreams and visions and hearing the voice of God and recording His revelations, but I’d never actually seen Him. I had never actually felt His hands. But on August 16th 2015, four angels appeared to me. And I don’t know who these four angels were, they didn’t give me their names, I don’t know who they were. But these four angels, they appeared to me, and they came to me, and they placed their hands on me. And yes, I felt their hands, they were tangible, they put their hands on me and I felt their hands. At which time, because I didn’t know what they were doing, I asked them the question ‘what are you doing?’, and one of these four angels spoke to me, and said ‘we are here to bless you so that you can serve God, and be with God. After that – that was the only thing that this angel said to me in the English language. After that these four angels simultaneously, they, with their hands on me, blessed me in a language that I don’t understand. And my only guess was that that language they were speaking was ‘The Holy Language’, the Adamic tongue. They were speaking and blessing me in this language that I didn’t understand. But as these four angels with their hands upon me were blessing me in that Holy Language, it was in that moment that these two powerfully strong hands reached down and they grabbed me by the shoulders. And these two hands ran down my arms until these two hands were holding my hands in His. And I knew that I was holding THE hands of Jesus Christ. Beautiful. It took some time to dig that up but it was beautiful. I have studied religious experiences extensively due to my own passion and interest in the subject matter. This one was beautiful. I have, of course, read many other very beautiful experiences with wide variation from many different religions. So there you have it! Jake has seen Jesus! As he shares that very personal account you can tell it is (obviously) very meaningful for him. I love religious experiences and think they should be studied in depth (and they have been). Of course, it almost goes without saying that I don’t think what he saw was really Jesus, or that Jesus even exists as a deity, that’s besides the point, the experience was significant for him. So there you have it, Jake’s claim to have seen Jesus and be called in some fashion by him as a new “messenger”. Sadly, this is where these eccentric religious characters go. They create many many hours of content, have incredible “experiences”, discover that “no one understands them” (or very few people understand them or are willing to believe them), and they move towards isolation in a cult compound. I’ve said this before but I’ll repeat, “Christianity is the fertile soil upon which Messiah and Prophet figures can spring forth”, we’ve seen it again and again over many, many years. I am curious of course about this particular (potential) move; which cult is it? Is it a generic Christian group? Who is connected? Is it his own one that he is himself starting and inviting his followers to join him at? etc. Lots of questions yet to be answered. I will say that Jake Hilton is very comparable to most original “creative genius” characters that begin religious movements. I have written an article here that goes over the lifecycle of religions in a good level of detail — here we are seeing a new star being born! — This is how religions begin, with some kind of background (Judaism, Christianity, Mormonism), some new claims and experiences, some new creativity and new ideas, and voila! New religion formed. OK, so, this is early on in Jake’s proselytising content. Later on in the series Jake becomes more and more aggressive towards the contemporary LDS church, however, in this video, presumably in an effort to deliver “milk” before “meat”, Jake is still reasonably gentle towards the church (sort of) — for example, he will still quote leaders including Thomas Monson, which is a classic engagement tactic when you have an audience in mind, you start by delivering to them what they already know and are already familiar with, before delivering “the new stuff”. Well, it is a four hour video so you can expect there to be a lot of content. Honestly, I won’t respond to each and every sentence as that could be a 10 hour video in itself, but I will give a high level overview of some topics. First segment: about 1.5 hours. The summary of the first segment of the video is “Jake is a right-wing, fundamentalist Christian”. He bashes a whole bunch of stuff; secularism, evolution, abortion, atheism, the left, Barack Obama, and others. Nothing surprising here, nothing really interesting here, skipping ahead. There IS actually one part of the video that I did like. After speaking about his passion for how evil abortion is, he speaks about his love for his daughter and family. That was sincere and beautiful. A good reminder that we’re all human and we all love our families, even if our viewpoints are dramatically different. He then speaks about a bunch of other stuff. Lots on the “authority” of “God’s word” (conveniently God’s true word just happens to be the Holy Books that Jake was taught are true from childhood (Bible, Book of Mormon, etc. ), and not the ones that he was not taught are true from childhood (Qur’an, Dianetics, Divine Principle, etc.) — lucky Jake!). Jake then proceeds to bash FairMormon, BYU, and the contemporary LDS church for their beliefs that the Book of Mormon occurred in Mesoamerica. This opens up what is actually an interesting topic so I’ll dwell on this for a while. It is correct that Joseph Smith believed and taught that the Book of Mormon events explained the existence of the American Indians as a lost tribe of Israel. Jake is spot on with this. In fact, this is what the LDS church claimed for over 100 years, until the evidence started pouring in more abundantly — which pushed them back. It’s important to understand the evolving narrative of Book of Mormon geography. (I actually wrote an article about this here). The long story short is everyone always believed it was in the “heartland”, until more and more evidence contradicted this viewpoint. The evidence is prolific and multi-faceted. We’re talking about DNA, archaeology, linguistics, the whole lot. Now FairMormon, notwithstanding the fact that I think they do some fantastic mental gymnastics, are not idiots. They know that the BoM could not have happened in the heartland, and so they’ve moved the geography backwards, with a magical act of smoke and mirrors, to Mesoamerica. Well yes, but have you stopped to figure out why? It’s actually quite simple: the heartland theory is indefensible, and while Mesoamerica is also indefensible, it’s ever so slightly less indefensible — slight enough to throw up the apologetic smoke and mirrors. Nowadays the LDS church just says to the effect of “the Book of Mormon geography is not a revealed subject”, and hopefully everyone just plays along. The heartland theory has been debunked both by FairMormon themselves (AKA, “other apologists”) and critics. “The last prehistoric North American horses died out between 13,000 and 11,000 years ago, at the end of the Pleistocene, but by then Equus had spread to Asia, Europe, and Africa.” source — again, look at as many reliable scientific sources as you want — so long as they’re not from Mormons who have a conflict of interest. “There are no elephants in North America now. However, five species of Proboscidea- the order to which elephants belong, roamed the lands of North America 13,000 years ago which also included mammoths, dwarf mammoths, and mastodons.” source — again, look at as many reliable scientific sources as you want — so long as they’re not from Mormons who have a conflict of interest. “Why would God reveal to Joseph Smith a faulty KJV text?” as Grant Palmer puts it. Written by Ethan Smith, who was Oliver Cowdry’s minister, View of the Hebrews is a fictional religious text about two groups of Israelites migrating from Jerusalem — a righteous group and a wicked group. The righteous group dies out and the wicked group are the ancestors of the modern American Indians. This was published in 1823 — 7 years before the Book of Mormon and even written in the same King James style. A textbook for children of Smith’s time, written in King James style, celebrating the war between the US and Britain. It has been pointed out (again refer to Chris Johnson’s presentation) that this has similarities with the so-called “war chapters” in late Alma. 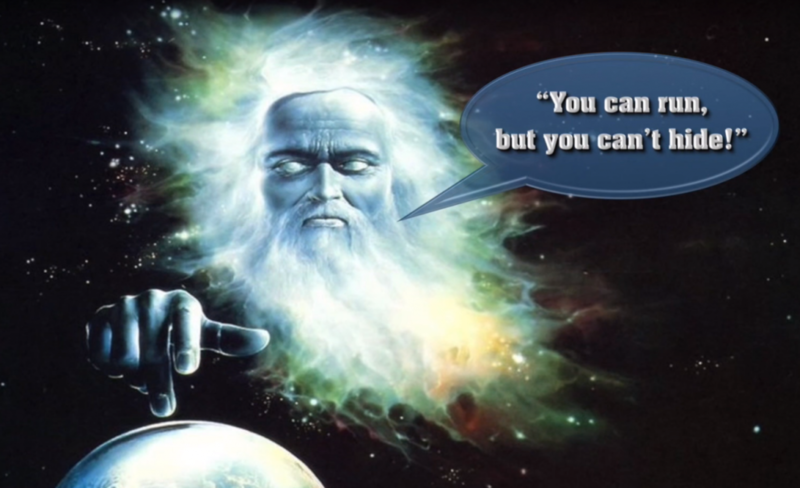 Issues with the reliability of the spiritual witness. 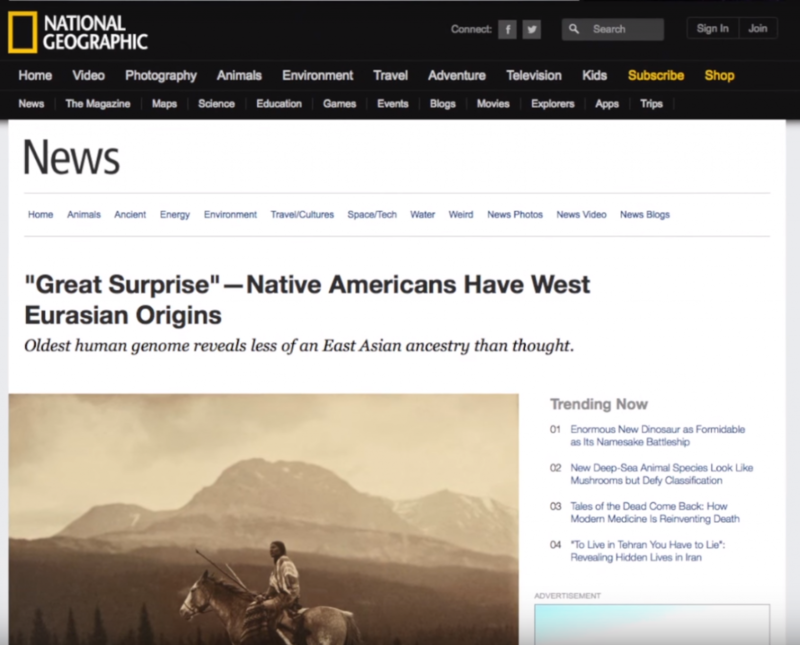 It’s actually quite funny, Jake references a National Geographic article briefly in his presentation. What does a 24 000 year old Siberian Youth partially descended from West Eurasia have to do with the American Indians? I thought the earth was created 6 000 years ago? I thought Lehi & family travelled via the Atlantic from Jerusalem to the United States. Do you even know where Siberia is? Again this is a great example of how “garage apologetics” works. Grab some headline, don’t bother to read the article, post it and say how it proves your point, and when someone points out any contradictions, just ignore the article (or person) because it / they contradict your worldview. This is a quick list he made of verses referencing horses and chariots while speaking about the anachronism. 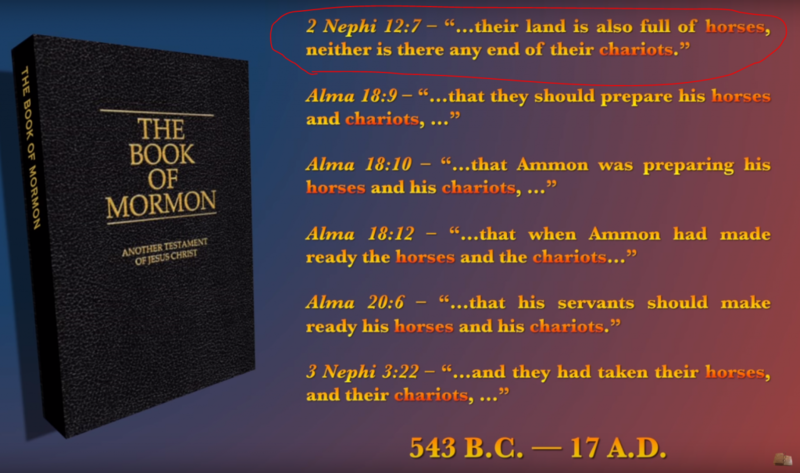 He really just slapped this one together because the top one I highlighted is an ISIAH chapter — references to horses and chariots there would not have been referring to the Book of Mormon geography, but pre-Isiah stuff. OK, enough with the criticism, I could go on all day about this. Enough with the back and forth discussion / debate on a myriad of random topics. I want to write a message to Jake Hilton himself, and my Mormon friend who is a strong supporter. I want to address this directly. I am not afraid of your God, or your Satan. For both are merely the imaginations of your mind. Allow me to explain why, and explain that in so saying, I am not too different from you. You know, there are millions of sincere Muslims around the world who believe YOU are going to hell. There are millions of sincere Catholics around the world who believe YOU are going to hell. Those people think that Satan has deceived YOU, and that’s why YOU don’t believe in Islam, Catholicism, the Jehovah’s Witnesses, AJ Miller, the Moonies, the list goes on. Why don’t you even give that a second thought? — you see — they all believe in a God, and they all believe in a Satan, but their God and their Satan seem to have a different agenda, either supporting or tearing down Islam, Catholicism, the Moonies, etc. — whatever the religion they happen to believe in, it seems God and Satan follow them. Why are you so confident that the Muslims are wrong? The Catholics? The Jews? How come you dismiss their threats of hell so easily? Can you see? We’re not too different. I just feel about your hell threats the same way you feel about theirs — that they are silly, childish, and baseless. The only difference between us is I realised I was in a religious box, and so I stepped out. He disclosed lot more his background information in his video than what online says, he even admitted that he was the chief of sinners before. Recommend you watch it and find out more about his past. By the way, 2 Nephi 12:7 is talking about Book of Mormon geographic. According to the context, this chapter actually is a prophecy of the promise land which is in the Book of Mormon geographic in North America. Well, all the scientific arguments, archeology evidences and online messages are quite confusing, it’s very difficult to know which one is true, e.g. There are numerous informations about “Evolution debunked by science” vs. “Creation debunked by science”… there are more examples like these if you want to find out, which one do you believe? Even Science itself is changing frequently, I don’t think we can 100% prove our arguments are truth unless we personally see, hear, smell, taste, feel and touch it at its present time. The idea that science is always changing, while true, is misrepresented, it’s not changing in the ways that are suggested. It’s not like we throw away our old textbooks every other weekend. To use an example, evolution was solid when it first came out and it’s only been polished ever since then, with more and more evidence found. No-one who is respected and well-known in biology thinks evolution is incorrect, including a whole bunch of BYU folks. If you’re open minded, I’d suggest watching a series like Cosmos – a spacetime odyssey https://en.wikipedia.org/wiki/Cosmos:_A_Spacetime_Odyssey by Niel DeGrasse Tyson, you can probably find it on netflix / online and it’s a really good series to set up many interesting and fundamental ideas about science. If you’re more serious than that, I’d recommend actually go look at university content on evolution etc. and you’ll notice that the only controversy around evolution is in religious circles, not scientific circles, and yes, YouTube has “lots of stuff”, but look for stuff that actually comes from the scientists. while i disagree with a few points this was all interesting to read. 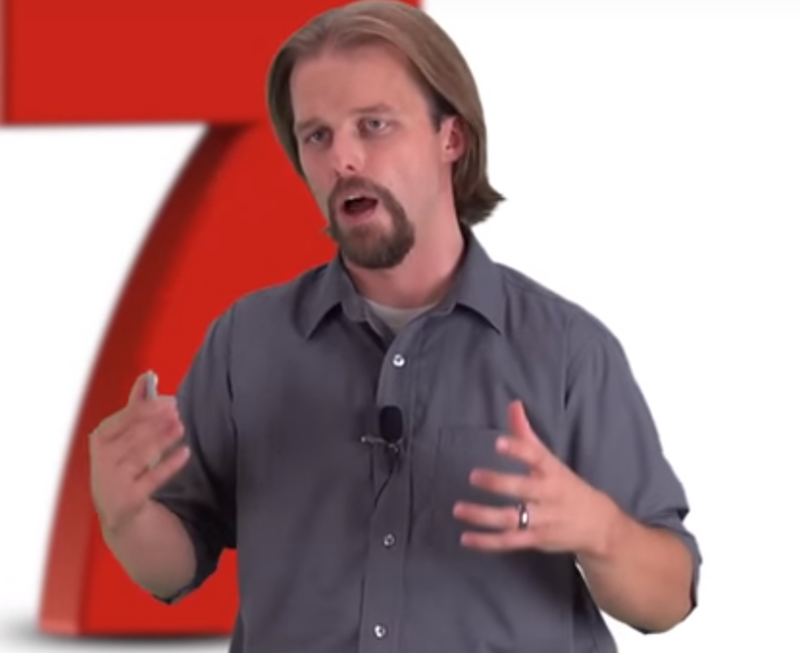 i heard about this guy-jake-on an apologetic forum and i was trying to figure out who he was. this clarified a few things. i do want to mention, though i dont want to really start out a war, is that the things you mentioned[regarding Mormonism]: plagiarism, archaeological evidence, more plagiarism, anachronisms, even more plagiarism, and so on and so forth has already been answered and responded to. but really its not even important because thats not really evidence, thats just lessening negative evidence. for the most part, their are things here and there. although when i think about it, its not really that crazy to think that theirs not that much evidence going for specific religions that are small like Mormonism. i mean theres only 15 millionish of us. and i seriously doubt that all of them are constantly researching history and archaeological evidence and stuff like that. other religions like Catholicism, which has more than a billion people in it, have a lot more resources and people both inside in out working on that evidences and stuff. same for atheism and everything in between. it can be argued that if you want it to be true, its true. and thats why theres so much evidence going in so many differing contradicting ways. ah if only i could live for 1000 years instead of just 80ish if im lucky, i could maybe, just maybe figure out where the truth really is. or i would just be in a bigger circle of confusion. more likely i would just give up. anyways, thanks for reading my ramblings, cheers! Thanks for this! I grew up with Jake (same ward, same high school; yes, his family has always been very active LDS) and we were friends, though not close. If someone had told me back then that one of us would end up a fundamentalist zealot and one of us would have one foot out of the church in 15 years, I’d never have guessed him to be the zealot. I haven’t visited your site before, but I appreciate your respectful and candid style. I absolutely love Jake’s family. They do have some significant mental illnesses that run in their family, and I’ve wondered if perhaps that has had an effect on his scrupulosity and zealousness. I do a search on him from time to time, just to see what he’s up to, but I come away feeling half fascinated and half sad. I’ve thought about reaching out to him, but the stuff he posts on his personal facebook page is crazy (he’s a huge fan of Donald Trump and a huge hater of gays and always going on about the end of days), so I’m not sure I should open that can of worms. Anyway, thanks again for your insights! Great site Shawn, and you have put a crazy amount of work into this. I must confess, that I did really enjoy Hilton’s Initial videos and the way he combined unique LDS doctrines with his in depth scriptural analysis. lt actually really helped my personal study of the scriptures and improved my relationship with my Heavenly Father because it got me thinking about some of the deeper meanings of these doctrinal points. Then he got ape crazy. Seriously…I feel embarrassed that I even recommended his initial stuff to some of my friends, but your research helps me understand the timeline a bit better. That post from his sister is heart wrenching. I feel so bad for his wife and children. Come on Jake- snap out of it! I haven’t had time to read all of your site, so am not quite sure what your motives are, but just wanted to comment on the fact that it is admirable that you would spend that much time watching Hilton’s videos and then do the write up on it. Why? What do you gain from it, or what do you want to have happen? Anyways, take care and keep up the unique commentary. Hi Dave, thanks for stopping by and for your kind comments! I did this as part of a “content exchange” with a church member friend of mine who is a Jake Hilton fan. I only watched a few hours of his videos certainly not all 80+! I did it to put more information out there for those who are interested in him. I have only spent maybe 20 hours in total on Jake Hilton, if I wanted more detail I’d go more into it but his commentary on a variety of subjects is super predictable and so I saw no value in spending more time on him.